A fiber optic star ceiling is the perfect addition to any home theater or kids' room. It consists of a ceiling outfitted with thousands of fiber optic lights which give the effect of looking into a star field when lit up. Although this project is time-consuming, the ceiling is easy to install. A fiber optic star ceiling is the perfect addition to any home theater or kids' room. It consists of a ceiling outfitted with thousands of fiber optic lights which give the effect of looking into a star field when lit up. Although this project is time-consuming, the ceiling is easy to install. If you do a little planning and make sure you have all the pieces you need, this project will go very smoothly. The first and most important step is determining what size panel you'll need to create a fiber optic star ceiling. This is crucial: You will need to know how many "stars" to use (they should be placed evenly), and larger panels are harder to install. Once you decide which area you're covering, cut a piece of medium-density fiberboard or plywood to those specifications. When cutting the plywood, you want to make sure the finished product is the exact size of the ceiling. If you are just covering a rectangular area, a table saw may be your best bet to get straight lines. 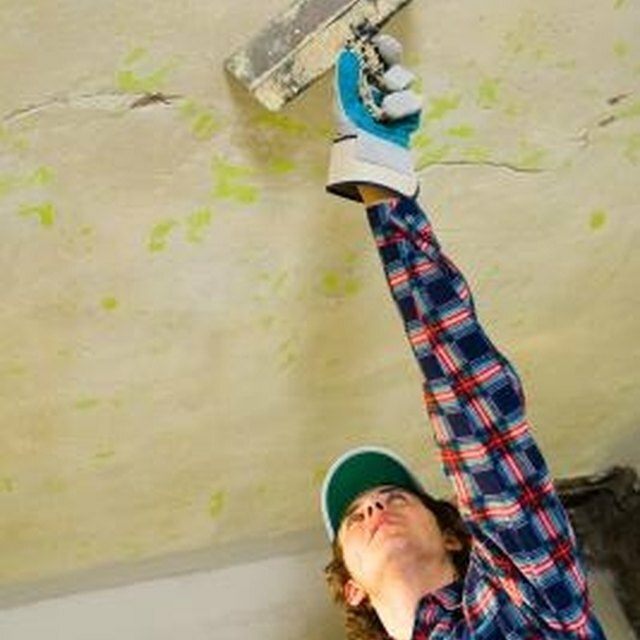 However, if you are constructing a ceiling with an odd shape, you will probably want to use a hand saw or router to get the edges you need. Also, keep in mind how you are mounting this to the existing ceiling. If you'll have access above the ceiling, you may want to bevel your edges so the star field sits on the old portion of the ceiling. If not, leaving the square edges should be fine. Also, if you do not have access above the ceiling, remember to add spacers to the existing ceiling to which you will attach the star field. The spacers will leave room for your fiber optics. Installing the stars will be the most time-consuming part of this project. The best thing to do is to split your false ceiling into even sections, then divide the fibers by the number of sections so each section has roughly the same number of stars. Since you want the fibers to fit snugly into the plywood, drill the holes for them using the smallest drill bit possible. Once all your holes have been drilled, feed the cables through the wood. Feed one cable through each hole and make sure each goes completely through the wood and sticks out a bit on the other side. Think about how you're going to bundle the fiber optic cables and where they are going to travel. Use the shortest length of cable possible, because you will want your light source as close as possible. Once all the stars have been threaded, it is time to install the star field. First make sure your fiber optic cabling is connected to the illuminator and that the illuminator works and is placed in an inconspicuous place, such a ventilated attic. If you don't have room above the existing ceiling, try to tuck the cables out of sight---hide it in piping down the wall, perhaps. Bolt the false ceiling to the existing ceiling.